Polk, L. L. (Leonidas La Fayette), 1837-1892. Industries -- North Carolina -- Statistics. Natural resources -- North Carolina -- Statistics. 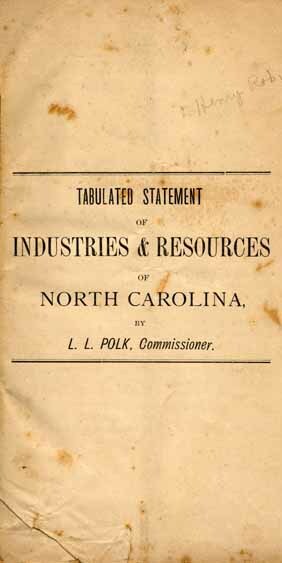 Mines and mineral resources -- North Carolina -- Statistics. Agriculture -- North Carolina -- Statistics. Raleigh, N. C., March 1st, 1878. The collection and publication of statistics and facts relating to the industries and general condition of our people, and the physical resources and advantages of our State, is of the highest importance to us at this time. The tabulated statements made on the following pages contain information greatly sought for, especially by foreigners and citizens of other States, now that public attention is being attracted towards our State, and it is very important that it should be as accurate as possible. These statements as a rule were made by a class of our citizens whose constant employment on the farm gave them but little time to devote to other matters, and when we consider this fact, the reports are creditably full and correct. But as these tables are designed to be placed prominently and permanently before the public in the Hand-Book, for which I am collecting material, it is important that each county should be fully and faithfully represented. These advanced sheets are therefore sent to you for your examination, and should you find any omissions or errors in the statement for your county, will you do the Department and its Correspondents the favor to correct on the blank form accompanying this Report, and return to this office at your earliest convenience? COUNTIES. Roman Catholic. Episcopal. Presbyterian. Methodist. Baptist. Lutheran. Christian. Quakers. German Reformed. Union. Dunkers, Campbellites. No. White. No. Colored. MALE FEMALE. Alamance, 45 23 Graham High School. Caldwell, 1 1. Finley High School. 1, Davenport F. College. Catawba, 54 18 1. Catawba College. Cleaveland, 65 16 4. Male and Female. Columbus, 56 28 Whiteville M. & F. Academy. Cumberland, 50 20 2. Little River & Donaldson. Fayetteville High School. Currituck, 7 7 1. Indian Ridge Academy. Davidson, 6 1 1. Yadkin College. 1. Thomasville. Duplin, 12 5. M. and F. High Schools. Edgecombe, 14 16 1. Tarboro. 1. Tarboro. Forsythe, 70 17 1. Salem Seminary. Franklin, 24 10 1. Louisburg College. Guilford, 80 40 1. Greensboro F. College. Hertford, 25 20 2. Wesleyan Chowan Bap't. Iredell, 75 20 1. Olin. 1. Simonton. COUNTIES. BENEVOLENT AND CHARITABLE INSTITUTIONS. Public Bridges. Columbus, 3, Masonic, 2 Odd Fellows. Graham, 1 Good Templar Lodge. COUNTIES. TOWNS, VILLAGES AND POPULATION. Alamance, Graham, (county seat) 480, Company Shops 800. Alexander, Taylorsville 185, York Institute. Anson, Wadesboro 900, Lilesville 300, Polkton 200, Ansonville 150. Ashe, Jefferson 300, Ore Knob 500. Bertie, Windsor 250, Woodville and Lewiston 100, Coleraine 50, Roxobel 50. Bladen, Elizabethtown 100, Abbotsburg 150. Buncombe, Asheville 1,500, Leicester 100, Weaverville 100. Cabarrus, Concord 1,500, Mt. Pleasont 500, Harrisburg 200. Caldwell, Lenoir 600, Patterson 100. Carteret, Beaufort 2,500, Morehead City 500, Newport 200. Caswell, Yanceyville 600, Milton 700, Leasburg 250. Catawba, Newton 500, Hickory 1,001, Conover, Catawba Station 112. Chatham, Pittsboro 400, Haywood 200, Lockville 150, Egypt 150, Gulf 100. Cleaveland, Shelby 1,100, King's Mountain 275. Columbus, Flemington, Bogue, Whiteville, Fair Bluff, Cerro Gordo. Davidson, Lexington 1,500, Thomasville 800, Yadkin College 200, Clemmonsville 250. Edgecombe, Tarboro 1,700, Rocky Mount 50, Battleboro 300, Whitaker's 200, Sparta 100. Forsythe, Winston 4,000, Salem 2,000, Kernersville 600. Franklin, Louisburg 900, Franklinton 350, Youngsville 100. Gaston, Dallas 800, Gastonia 100, Cherryville 50, Brevard's 50. Granville, Ox'd 1,200, Hen'n 1,000, Kitt's 250, W'boro 150, T'ville 100, Tally Ho 50. Greene, Snow Hill 400, Hookerton 300, Contentnea 20. Guilford, Greensboro 3,500, Jamestown 300, High Point 500. Hertford, Murfreesboro 1,000, Winton 350, Harrellsville 200. Hyde, Germantown, Nebraska, Middleton, Engelhard. COUNTIES, PRINCIPAL KINDS OF TIMBERS. Alexander, Oak and White Pine. Alleghaney, Oak, Chestnut, Poplar, Pine, Maple. Anson, Oak, Hickory, Pine, Ash, Gum, Poplar, Birch, Maple. Ashe, Oak, Walnut, Sugar Maple, Poplar, Cucumber, Hickory. Beaufort, Pine, Oak, Cypress, Juniper. Bertie, Pine, Oak, Cypress, Juniper, Ash, Gum. Bladen, Pine, Oak, Cypress, Juniper. Brunswick, Pine, Juniper, Cypress, Cedar, Live Oak, Ash. Buncombe, Oak, Pine, Walnut, Poplar, White Pine, Hickory. Burke, Oak, Pine, Walnut, White Pine, Hickory, Chestnut, Ash. Cabarrus, Oak, Walnut, Ash, Poplar, Cedar, Maple, Hickory, Beech. Caldwell, Oak, Walnut, Chestnut, White Pine, Hickory, Birch, Ash. Caswell, Pine, Oak, Hickory, Walnut, Poplar, Chestnut. Catawba, Pine, Oak, Hickory, Ashe, Chestnut, Walnut, Cherry. Chatham, Oak, Hickory, Gum, Pine. Cherokee, Oak, Hickory, Pine, Poplar, Walnut, Chestnut, Cherry. Chowan, Oak, Pine, Juniper, Ash, Cypress, Hickory. Cleaveland, Oak, Pine, Hickory, Chestnut. Columbus, Pine, Cypress, Juniper, Oak. Craven, Oak, Pine, Poplar, Cypress Gum. Cumberland, Pine, Oak, Poplar, Hickory, Cypress, Juniper Ash. Currituck, Pine, Cypress, Gum, Poplar, Oak, Juniper, Cedar. Dare, Pine, Oak, Hickory, Cypress, Juniper. Davie, Oak, Hickory, Ash, Gum, Pine, Poplar. Duplin, Pine, Oak, Poplar, Hickory, Ash. Edgecombe, Pine, Cypress, Oak, Hickory, Ash, Poplar, Gum. Forsythe, Oak, Hickory, Walnut, Pine, Cedar, Locust, Dogwood. Franklin, Pine, Oak, Gum, Maple, Walnut, Hickory. Gates, Oak, Pine, Cypress, Juniper. Graham, Locust, Chestnut, Oak, Cherry, Walnut, Pine, Linden. Greene, Oak, Walnut, Chestnut, Pine, Hickory, Cedar, Locust. Guilford, Pine, Oak, Hickory, Poplar, Cypress. Halifax, Pine, Oak, Hickory, Poplar, Maple, Cypress, Juniper. Haywood, Ash, Oak, Hickory, Walnut, Maple, Cherry, Poplar. Henderson, Oak, Pine, Poplar, Ash, Chestnut, Linden, Hickory. Hyde, Cypress, Pine, Gum, Maple, Holly, Juniper, Cedar, Oak. Jackson, Oak, Chestnut, Poplar, Hickory, Walnut. Number. Spindles, Looms, Number. Spindles. Looms. Beaufort, 4 Iron and Magnesia. Caswell, 1 Iron, Alum, Lithia, Lime, Magnesia. COUNTIES MILLS. MANUFACTORIES OF MACHINERY, IMPLEMENTS, FURNITURE, &C.
Alamance, 40 24 Furniture 4. Alleghany, 20 9 Furniture 4, Saddlery 1. Ashe, 1 40 1 29 Furniture 3. Beaufort, 6 11 5 11 Plows 1. Buncombe, 1 46 3 44 Furniture 3. Cabarrus, 5 34 4 12 Implements and Mach'y 2, Furn't. 8. Caldwell, 1 50 2 39 Implements 1, Furniture 5. Carteret, 2 3 2 Wind Mills 50. Caswell, 15 13 Implements 2, Furniture 2. Catawba, 47 2 38 Implements 1, Furniture 1, S. Fac. 1. Chatham, 48 5 13 Implements 1. Chowan, 4 4 3 4 Furniture 2. Cleveland, 52 3 43 Machinery S. M. 1, Sash and Blind 2. Columbus, 1 50 3 5 Furniture 1. Craven, 12 6 6 5 Implements 4, Furniture 2. Cumberland, 51 3 25 Furniture 4, Implements 2. Currituck, 4 1 3 Wind Mills 9. Davidson, 2 14 4 16 Implements 4. Forsythe, 2 28 8 11 Furniture 8, Implements 1. Franklin, 1 20 7 9 Furniture 3, Implements 4. Gaston, 23 5 14 Implements 1, Furniture 5. Granville, 36 3 20 Implements 2. Guilford, 2 50 3 20 Furn't. 4, Spoke and H. Fac. 4, Im. 6. Halifax, 12 45 12 7 Furniture 3. Haywood, 41 19 Furniture 1. Henderson, 17 1 17 Furniture 1, Saddlery 1. Hyde, 6 2 5 Implements 12. Iredell, 29 3 29 Furniture 2. Jackson, 11 17 Furniture 1. COUNTIES. GEN'L CHARACTER OF SOIL. Iron Furnaces. Foundries. Lime Kilns. MINES. OTHER MINERALS. Alamance, Mixed. 3 2 Copper is known to exist. Alleghany, 3 Copper, Plumbago, Iron. Buncombe, Dark grey loam. 1 Mica. Burke, 15 Plumbago, Mica, Iron. Cabarrus, Mulatto, grey san'y. 2 2 4 1 Iron. Caldwell, Dark grey loam, 5 Silver, Copper, Mica, Iron, Manganese, Asbestos. Camden, Sandy and clay. Silver, Copper, Mica, Iron, Manganese, Asbestos. Chatham, Sandy to clay. 2 1 Iron, Gold, Copper, Coal. Davie, Red, black, grey. 1 Iron, Copper, Silver. Forsythe, Grey, red clay. 1 4 Iron, Manganese. Gaston, Red, grey sandy. 4 Barytes, Iron, Manganese. Graham, Sandy black loam. 1 Copper, Silver, Lead. Granville, Sandy, clay, varied. 3 Gold, Silver. Greene, San'y, loam cl'y sub. Guilford, Sand to red clay 1 4 11 Iron, Copper, Gold, Koline. Halifax, Clay, sand, rocky. 2 1 Iron, Gold, Copper, Mica. Harnett, San'y, clay subsoil. 1 Iron. Henderson, 1 4 Gold, Silver, Mica, Lead, Copper. COUNTIES, Carriage & Wagon Manufactories. Marble. Granite. Sandstone. Soapstone. Mill Stone. Marls. Potteries Tanneries Fisheries. Turpentine Dist. Criminals, Aug. 1, 1876, to Aug. 1, 1877. Alamance, Undulating. Corn, wheat, rye, oats, cotton, tobacco. Alexander, Hilly. Corn, wheat, oats. Alleghany, Corn rye, oats, wheat, buckwheat. Anson, Cotton, corn, wheat, oats, rye, potatoes. Ashe, Hilly and mountain. Corn, wheat, rye, oats, hay, buckwheat. Beaufort, Level. Cotton, corn, potatoes. Bladen, Slightly undulating. Corn, rye, oats, potatoes, peas, cotton. Brunswick, Level. Cotton, corn, potatoes, peanuts, rice. Buncombe, Mountainous, Corn, wheat, oats, rye, tobacco, grass, b. wheat. Burke Mount's and hilly. Corn, wheat, rye, oats, potatoes, hay, sorghum. Cabarrus, Undulating. Cotton, corn, wheat, oats, clover, and grasses. Caldwell, Mountainous, hilly. Corn, wheat, oats, rye, cotton, peas, rice, tobacco. Camden, Level. Corn, oats, peas, potatoes. Carteret, Level. Corn, cotton, potatoes. Caswell, Undulating. Corn, wheat, oats, tobacco. Catawba, Undulating. Corn, wheat, oats, rye, tobacco, clover, grasses. Chatham, Undulating & hilly. Wheat, corn cotton, hay tobacco. Cherokee, Rough and broken. Corn, wheat, hay, rye, oats. Cleaveland, Hilly. Corn, wheat, oats, cotton, potatoes. Columbus, Level. Corn, cotton, peas, potatoes, rice. Craven, Level. Corn, cotton, peas, potatoes. Cumberland, Slightly undulating. Corn, cotton, potatoes, peas, wheat, rye, oats. Currituck, Level. Corn, oats, wheat, potatoes, melons. Davidson, Hilly, Wheat, corn, oats, tobacco. Davie, Undulating. Corn, tobacco, cotton, wheat, rye, oats. Duplin, Level. Cotton, corn, sweet potatoes, peas. Edgecembe, Level, Corn, cotton, peas, potatoes, wheat, oats. Forsythe, Hilly & undulating. Corn, wheat, oats, rye, tobacco, potatoes. Franklin, Undulating & level. Corn, cotton, wheat, oats, tobacco. Gaston, Hilly. Corn, cotton, wheat, oats. Gates, Level. Corn, wheat, oats, rye, potatoes, peas, cotton. Graham, Mountainous. Corn, rye, wheat, oats, buckwheat, grasses. Granville, Undulating. Tobacco, wheat, corn, oats, rye, grasses. Greene, Level. Corn, cotton, wheat, oats. grasses, rye, peas, po's. Guilford, Hilly & undulating. Wheat, tobacco, corn, oats, grasses. Harnett, Level and hilly. Corn, wheat, cotton, potatoes, peas, oats, rye. Haywood, Undulating. Corn, wheat, oats, grasses. Henderson, Undulating. Corn, oats, wheat, potatoes, rye. Hertford, Level. Corn, cotton, wheat, oats, peas, potatoes. Hyde, Level. Corn, wheat, oats, peas, potatoes, cotton. Iredell, Undulating. Tobacco, corn, cotton, wheat. Jackson, Mountainous. Corn, rye, wheat, oats. COUNTIES, FRUITS. Private Fish Ponds. Alamance, Apples, peaches, pears, apricots, cherries, grapes. Alexander, Apples, peaches, in fact all kinds. Bertie, Apples, strawberries, melons, grapes. Caswell, Apples, peaches, pears, grapes, plums. Cherokee, Apples, pears, peaches, and small fruits. Chowan, Pears, grapes, peaches, apples. Currituck, Peaches, pears, apples, cranberries, blackberries. Dare, Apples, peaches, pears, watermelons. Gates, Apples, peaches, pears, grapes, plums, cherries. Graham, Apples, peaches, pears, berries. Greene, Apples peaches, pears, plums, grapes. Guilford, Apples, pears, grapes, in fact all fruits of the climate. Henderson, Apples, cherries, peaches, plums. Hertford, Apples, pears, peaches, grapes. Hyde, Apples, peaches, grapes, pears, plums. The foregoing pages comprise 47 counties--one-half of the number in the State. The following pages contain similar statistics for the remaining counties. No White. No. Colored. MALE. FEMALE. Lincoln, 35 10 1. Lincoln Academy. 2. Male and Fe. Madison, 27 3 2. Male and Female. Onslow, 20 7 1. Richland Male & Fe. Randolph, 60 15 1. Trinity College. Robeson, 49 23 1. Floral College. Sampson, 73 20 1. Clinton F Inst. Wilkes, 94 18 3. Male and Female. Wilson, 8 1 1. Mixed. 1. Wautauga, 1 Masonic Lodge, 2 Friends of Temperance. Johnston, Smithfield 400, Clayton 220, Selma 290, Pine Level 200, Princeton 210. Jones, Trenton 100, Pollocksville 50. Lenoir, Kinston, 1,500, La Grange 350. Lincoln, Lincolnton 1,100, Denver 200. McDowell, Marion 700, Old Fort 300. Nash, Nashville 150, Battleboro 60, Castalia 50, Rocky Mount 600. Northampt'n Jackson 200, Seabord 50. Onslow, Richland 125, Jacksonville 100, Swansboro 200. Pitt, Greenville 1,200, Marlboro 125, Farmville 100, Bethel 50. Randolph, Ashboro 275, Cedar Falls 300, Franklinsville 400, Trin. C. 200, Columbia 250. Richmond, Rockingham 1,200, Laurinburg 50. Robeson, Lumberton 800, Shoe Heel 200. Rockingham Leaksville 700, Madison 300, Wentworth 200, Reidsville 1,200, Ruffin 125. Rutherford, Rutherfordton 476, Burnt Chimney 125. Stanly, Albemarle 400, Big Lick, 50, Centre 75. Stokes, Danbury 260, Germantown 250, Prestonville 100. Surry, Dobson 200, MtAiry 500, Elkin 100. Union, Monroe 2,500, Griffinsville 50. Wayne, Goldsboro 3,500, Fremont 700, Mt. Olive 231. Wilson, Wilson 2,500, Toisnot 350, Black Creek 20, Statonsburg 100, Saratoga 100. Yadkin, Huntsville, Yadkinville, Jonesville, East Bend, Hamptonville. COUNTIES. PRINCIPAL KINDS OF TIMBERS. Jones, Pine, oak, ash, beech, cypress, juniper, hickory, poplar. Lenoir, Pine, oak, hickory, gum, cypress, ash, maple. Lincoln, Oak, pine, hickory, chestnut, poplar, ash, walnut, maple. Macon, Oak, hickory, poplar, cherry, buckeye. Madison, Oak, pine, ash, poplar, hickory, birch, walnut, chestnut. McDowell, Oak, hickory, poplar, walnut chestnut. Mitchell, Poplar, oak, chestnut, walnut, ash. Montgomery Pine, oak, hickory, ash. Nash, Pine, cypress, oak, gum, dogwood. Northampton Oak, pine, cypress, ash, hickory. Onslow, Pine, oak, hickory, ash, juniper, cypress. Pamlico, Pine poplar, ash, gum, oak, holly, beech. Pasquotank, Pine, oak, cypress, juniper, poplar, ash, gum. Perquimans, Pine, oak, ash, gum, poplar, hickory, maple, juniper, cypress. Person, Pine, poplar, ash, walnut, hickory. Pitt, Pine, oak, cypress, hickory, gum, poplar. Polk, All kinds common to that section of the State. Randolph, Oak, hickory, pine, poplar, walnut. Robeson, Pine, oak, hickory, cypress. Rowan, Oak, hickory, ash, walnut, maple, poplar, pine. Rutherford, Oak, walnut, poplar, maple, hickory, ash, pine, cherry. Sampson, Pine, oak, poplar, hickory, ash, walnut, cypress, juniper. Stokes, Pine, oak, chestnut, hickory, walnut, poplar. Surry, Chestnut, pine, poplar, hickory, walnut, locust, oak, cherry. Swain, Walnut, oak, poplar, pine, birch, beech, ash. Transylvania Oak, ash, hickory, chestnut, walnut, maple, gum, pine. Tyrrel, Pine, oak, juniper, cypress. Warren, Oak, pine, poplar, persimmon, walnut, hickory, ash, maple. Washington, Cypress, juniper, pine, oak, poplar, ash. Watauga, Oak, chestnut, poplar, pine, sugar maple, cherry, walnut. Wilkes, Oak, pine, chestnut, hickory, walnut, poplar. Wilson, Pine, oak, hickory, ash, cypress, gum. Yadkin, Hickory, poplar, ash, oak. Yancey. Poplar, oak, chestnut, hickory, sugar maple, buckeye. COUNTIES. MINERAL SPRINGS FACTORIES. Carding Machines. Onslow, 2 Sulphur, 4 Alum and Sulphur. Washington, Shocco, Jones, White Sulphur & others. Wilson, 14 Iron and Magnesia, 1 Sulphur. COUNTIES, MILLS. MANUFACTORIES OF MACHINERY, IMPLEMENTS, FURNITURE, &C.
Johnston, 14 52 16 18 Implements 1. Lenoir, 4 16 7 6 Implements 1. Lincoln, 30 2 30 Furniture 5. Macon, 6 8 Furniture 1, Implements 1. Madison, 40 30 Furniture 3, &c.
Montgomery 5 26 4 13 Furniture 2. Onslow, 4 14 6 4 2 Wind Mills. Pasquotank, 4 3 6 2 Furniture 2. Person, 20 18 Implements 1. Pitt, 8 14 11 4 Implements 4. Randolph, 1 58 2 37 Furniture 5, Bobbin 1, Sash and B. 1. Richmond, 25 25 3 30 Furniture 3. Rockingham 1 37 1 14 Implements 1. Rowan, 1 16 2 7 Implements 2. Rutherford, 45 22 Furniture 5. Sampson, 5 56 8 25 Implements 1. Stanly, 2 26 2 11 Furniture 3. Stokes, 60 1 35 Furniture 1. Surry, 46 30 Shoe F. 1, Furniture 4, Sash and B. 1. Watauga, 29 18 Furniture 2, Shingle Factory 2. Wayne, 10 8 7 Implements 2, Furniture 1, S. & B. 2. Wilkes, 95 54 1 Organs, Melodians, Mill Fixtures. Wilson, 5 25 4 7 Furniture 1, D., S. & B. 1, Imple's. 3. GENERAL CHARACTER OF SOIL. Iron Furnaces. Foundries. Lime Kilns. MINES OTHER MINERALS. Johnston, Sandy, loam cl'y sub. Macon, Red clay. Iron, mica, corundum, copper. McDowell, Light grey & clay Iron, copper, silver, mica, lead. Montgomery Varied, sand to clay 7 Iron. Onslow, San'y loam cl'y sub. Pamlico, Black loam cl'y sub. Pitt, San'y loam, cl'y sub Pyrites, iron. Polk, Clay. 5 Iron ore.
Randolph, Red clay and sandy Gold, silver, copper, iron. Rowan, Red clay. 2 2 Copper, silver. Rutherford, Clay and grey san'y 7 Iron, gold, cop., mica, plum., cor. Stanly, Red and gravelly. 4 Zinc. Stokes, Red and grey. 1 Lead, Coal, Mica, Iron, Manganese, Asbestos. Surry, Red and grey. 5 1 Lead, Coal, Mica, Iron, Manganese, Asbestos. Swain, Black soil. 3 Sil., lead, copper, mica, saltpetre. Transylvania Clay and bot. alluv. 6 Mica, copper, iron. Union, Grey slate sand cl'y Gold. Warren, Clay to sand loam. 1 Gold. Watauga, Very rich. Iron, mica, plum., gold, silv., cop. Wilkes, Black sandy loam. 1 Gold, mica, graph., manganese. Wilson, Sandy to clay. 1 Iron. Yadkin, Clay. 1 1 Iron. COUNTIES, Carriage & Wagon Manufactories Marble. Granite. Sandstone. Soapstone. Mill Stone. Marls. Potteries. Tanneries. Fisheries. Turpentine Dist. Criminals, Aug. 1, 1876, to Aug. 1, 1877. Jones, Level. Corn, peas, cotton, rice, potatoes, wheat, rye, oats. Lenoir, Slightly undulating. Corn, rice, cotton, wheat, rye, oats, peas, potat's. Lincoln, Undulating. Corn, wheat, oats, cotton, tobacco, peas, rye. Macon, Mountainous. Corn, wheat, rye, oats, potatoes. Madison, Hilly and mountain. Corn, wheat, tobacco. McDowell, Undulating. Corn, wheat, oats, tobacco. Mitchell, Corn, wheat, oats, rye, flax, grasses. Montgomery Hilly. Corn, wheat, oats, cotton. Nash, Level & undulating. Corn, cotton, potatoes, peas. Northampt'n, Undulating. Corn, wheat, cotton, peas, oats, rye. Onslow, Level. Corn, cotton, peas, peanuts, sweet potatoes. Pamlico, Level. Corn, tobacco, cotton, potatoes, rice, peas, wheat. Pasquotank, Level. Corn, cotton, flax, oats, peas, potatoes. Person, Undulating. Tobacco, corn, wheat, oats, potatoes. Pitt, Undulating. Corn, cotton, oats, peas, potatoes, wheat, rye. Polk, Hilly & undulating. Corn, sorghum, oats, rye, wheat, cotton, tobacco. Randolph, Hilly. Corn, wheat, oats, grasses, clover, turnips. Richmond, Level & undulating. Corn, cotton. Robeson, Level. Corn, cotton, peas. Rockingham Hilly, Tobacco, corn, wheat, oats. Rowan, Undulating. Corn, wheat, oats, cotton, tobacco. Rutherford, Hilly & undulating. Corn, cotton, wheat, sorghum, oats, tobacco, potat's. Stanly, Undulating. Corn, wheat, oats, cotton. Stokes, Mountainous, hilly. Corn, tobacco, wheat, rye, oats, potatoes, grasses. Surry, Mountainous, Corn, wheat, rye, tobacco. Swain, Mountainous. Wheat, corn, rye, oats, sorghum. Transylvania Mountainous. Corn, rye, wheat, buckwheat, oats. Tyrrel. Level. Corn, cotton, peas, potatoes. Union, Undulating. Corn, cotton, wheat, oats. Washington, Level, Corn, cotton, wheat, potatoes. Watauga, Mountainous. Corn, wheat, rye, oats, buckwheat, potatoes. Wayne, Level. Corn, cotton, rye, wheat, oats, potatoes. Wilkes, Mount's and hilly. Corn, wheat, rye, oats, tobacco, potatoes. Yadkin, Hilly. Corn, wheat, rye, oats, tobacco. Yancey, Mountainous. Wheat, corn, oats, rye. Jones, Apples, peaches, plums, Nectarines, pears, grapes. Macon, Apples, cherries, plums, strawberries. Madison, Apples, peaches, grapes, berries. Montgomery Apples, peaches, cherries, plums, grapes. Northampt'n Apples, pears, peaches, melons, berries. Polk, All kinds especially in the "Thermal Belt." Randolph, Apples, peaches, pears, grapes. Rockingham Apples, peaches, pears, cherries. Surry, Apples, peaches, plums, &c.
Washington, Apples, pears, peaches, plums. Watauga, Apples, peaches, and all fruits of the climate. Yadkin, Apples, peaches, pears, plums, berries. COUNTIES. NAME OF FACTORY OR MILL. WHERE LOCATED. Water. Steam. No. of No. of Spindles. When put in Operation CAPACITY PER DAY. Caldwell, Patterson, Patterson, 1 18 960 1872 600 yds. sheeting, 250 lbs. cotton yarn, 150 lbs. wool yarn. Catawba, Granite Shoals, Catawba Riv 4 m. from W N C R R. 1 24 1200 1854 590 pounds cotton. Cleaveland, Cleaveland Cotton Mills, 12 miles north of Shelby, 1 20 828 1874-5 450 pounds warp. 725 4-4 domestic. Cumberland, Beaver Creek, 6 miles southwest of Fayetteville, 1 75 2900 1841 3000 yards sheeting and 25 bundles yarns. McDowell, Muddy Creek, 6 miles from Marion, 1 12 408 1874 40 bunches yarn, 400 yards sheeting. Rockingham, Leaksville Cotton Mills, Near Leaksville, 1 80 3632 1839 1500 pounds cotton. Alamance, Granite Cotton Factory, Haw River, 1 110 4856 1845 6 bales of 450 pounds each. Mecklenburg Glenroy Cotton Mills, 2 miles from Mathews, C. C. R. R. 1 264 1878 35 bunches warps 5 pounds each. Surry, Elkin Valley Mills (Wool), On Big Elkin Creek, 1 2 240 1877 150 pounds yarn. COTTON AND WOOLEN MILLS IN NORTH CAROLINA. COUNTIES. STYLE OF GOODS. No. of Operativ's NEAREST NAVIGABLE WATER OR RAILROAD. Capital Invested. Does Cold Weather Stop Operations, and Generally, How Long: REMARKS. Cabarrus, Sheeting, yarns, and twine 17 No Name of firm--Weisler & Archibald. Caldwell, Yarns and heavy sheeting 50 25 miles to Hickory, No Name of firm--Gwyn, Harp & Co.
Catawba, Carpet warps 50 4 m. from W N C and 5 m. from A., T & O., 25 000 On average 5 days per year, Dam across the river with a fish way--Claywell, Powell & Co.
Chatham, Yarn, wrap and sheeting, 40 Raleigh and Augusta Air-Line Railroad, 52 000 No Capacity of water power equal to 700 horse, using about 50--Bynum Manufacturing Co.
Cleaveland, Warps and domestics, 28 12 miles to Carolina Central Railway, 25 000 No Name of firm--Schenck, Raymour & Co.
Craven, Yarns, warps, twines, 25 Neuse river and Atlantic and N. C. Railroad, 25 000 No Jesse D. Claypool, President; Gwo. Allen, Treasurer; Richard Berry, Manager. Cumberland, 4-4 sheeting, coarse yarn, 72 Cape Fear river and Western railroad, 145,000 No John Shaw, President. Cumberland, 4-4 sheeting, 72 Cape Fear river and Western railroad, 145,000 No John Shaw, President. Franklin, Yarns, 12 Raleigh & Gaston railroad, 15,000 No Water power sufficient for 100 looms--J. F. Jones. Gaston, Sheeting, shirting, yarns and warp, 100 Atlanta & Charleston and C. C. R. R., 75,000 No C. J. Lineburger & Sons. Gaston, Warps, 26 Tuckaseege Depot Carolina Central railway, 36,000 No About as much more machinery will soon be in operation. Gaston, Yarns and sheetings, 50 Charlotte and Augusta Air-Line railroad, 30,000 No Water power sufficient for 100,000 spindles--Homesley & Oates. Halifax, Single and double yarns and plow lines, 26 Wilmington & Weldon railroad, 40,000 No John T. Bellamy. McDowell, Yarns and sheeting, 21 Western North Carolina railroad, 20,000 A few days Burned down October 1st, 1877--H. C. Bennett. Randolph, Yarns and 4-4 sheeting, 75 North Carolina raiload, 35,000 No Hugh Parks, Agent. Richmond, 4-4 sheeting, 130 Carolina Central railway, 150,000 No Robt. L. Steele, President. Richmond, Plaids and stripes, 120 Carolina Central railway, 150,000 No Henry Reshton, Superintendent. Rockingham, Brown sheeting, yarns, knitting cotton, 106 Piedmont railroad, 12 miles to Reidsville, 125,000 4 days per year J. Turner Morehead & Co.
Surry, 8 Railroad at Statesville, 35 miles, 8,000 No L. L. Gwyn and A. Chatham. Alexander, Cotton yarn and sheeting, 24 Western North Carolina railroad, 16,000 Very rarely, Alspaugh & Bro. Alamance, Ginghams, 60 North Carolina railroad, 25,000 No Have in connection flour and grist mill, saw mill, cotton gin, wool carding machine, &c.
Nash, Shirting, sheeting, yarns, rope, warp, 90 1 mile from Wilmington & Weldon railroad, No Have 3 warp mills and 1 rope machine. Alamance, Plaids, cottonades, drills, yarns, warps sheeting, shirting 165 North Carolina railroad No T. M. Holt. Gaston, Ginghams, shirting and sheeting, 150 3 miles to C. C. railroad, No Most excellent water power G. K. Tate. Buncombe, Jeans satinets and linseys, 10 20 miles to Henry's, No E. D. Jobe. New Hanover, Print cloth, 28 inches 64-64, 95 Cape Fear river, 125,300 No Driven by a Harris Corliss engine, 16 inch cylender, 48 inch stroke. Mecklenburg, Warps, 7 C. C. railroad. 7,000 No E. C. Grier & Son. Clement attachment spin from seed cotton. Surry, Warps, yarns and sheeting, 35 45 miles to railroad, 40,000 10 days, J. F. & W. A. Moore. Excellent water powers in this coonty. Randolph, 44 sheeting, yarns and carpet warps, 90 Richmond & Danville railroad, 25,000 No O.K. Cox, Agent. Surry, 4-4 Jeans, 68 35 miles to Statesville, 8,000 No Flour mill attached. Surry, Cotton yarns, No, 12 sheeting, 32 38 miles to Statesville 20,000 No Center of a fine trade from the mountain counties. Randolph, 4-4 sheeting, yarns, knitting cotton, thread and twine, 50 Greensboro, 20,000 No D. Curtis, Agent. Randolph, Domestic ginghams, 200 High Point, 100,000 No Pay rolls $2,500 per month--Jno. B. Randleman, President. Extra time for 6 mos. past. It will be seen by reference to the following statement, that I give the names of fifty-three mills, seven of which have not reported. Of the forty-six reported, five are operated by steam and forty-one by water. It will be observed, also, that several of the mills have not the number of looms reported, while others have omitted the capacity, and others still the number of operatives and the amount of capital invested. Seven of the mills, as before stated, have not reported. Thirty-five report amount of capital invested which aggregates $1,547,300. The aggregate number of operatives in the forty-four reported is 1620. The aggregate number of spindles employed in the forty-five mills reported is 82,240. Only seven report that their operations are ever checked by cold weather, and those rarely, and only for a few days. That this interest will soon become a very important one in our industrial wealth none can doubt, and it is very desirable that a full and complete exhibit of its growth and progress should be kept before the public. I therefore hope, if there be errors or omissions in the statement, that you will at once correct and return to this office. I want every Cotton and Woolen Mill in the State represented in this list. P. S.--Will the reader examine the report for his county carefully, and write me at once giving corrections, if any are to be made. In the second column, opposite the name of the county, the name of the county seat is given and is designated by the letters C. H. In the same column are the names of the other towns or villages in the same county, and the third column shows their distance and direction from the county seat. The population for each county is taken from the census of 1870. Any corrections to this table will be thankfully received. CITIES, TOWNS AND VILLAGES IN NORTH CAROLINA. COUNTIES, Names of Cities, Towns and Villages. Direction and Distance from County Seat. On What Railroad or Navigable Water. POPULATION. Beaufort, Yeatesville. Northeast 20 miles. Beaufort, Leachville, Northeast 36 miles, Pungo River. Carteret, Morehead, Southwest 3 miles, Atlantic & N. C. Railroad. Carteret, Newport, Northwest 11 miles, Atlantic & N. C. Railroad. Currituck, Shingle Landing. northwest 12 miles. Duplin, Magnolia, southwest 7½ miles, Wilmington & Weldon R. R.
Duplin, Rose Hill, southwest 13 miles, Wilmington & Weldon R. R.
Duplin, Teacheys, fouthwest 15 miles, Wilmington & Weldon R. R.
Duplin, Duplin Road, southwest 17 miles, Wilmington & Weldon R. R.
Duplin, Warsaw, west 10 miles, Wilmington & Weldon R. R.
Edgecombe, Rocky Mount, west 18 miles, Wilmington & Weldon R. R.
Edgecombe, Battleboro, northwest 18 miles, Wilmington & Weldon R. R.
Edgecombe, Whitakers, northwest 20 miles, Wilmington & Weldon R. R.
Forsythe, Kernersville, east 9 miles, N. W. N. C. R. R.
Johnston, Clayton, northwest 11 miles, North Carolina Railrord. Johnston, Selma, northeast 4 miles, North Carolina Railroad. Johnston, Pine Level, northeast 6 miles, North Carolina Railroad. Johnston, Princeton, east 10 miles, North Carolina Railroad. Nash, Whitaker's, northeast 22 miles, Wilmington & Weldon R. R.
Nash, Battleboro, east 18 miles, Wilmington & Weldon R. R.
Nash, Rocky Mount, east 12 miles, Wilmington & Weldon R. R.
Nash, Sharpsburg, southeast 14 miles, Wilmington & Weldon R. R.
Northampton, Garysburg, west 10 miles, P. & W. R. R. and S. & R.R. Northampton, Pleasant Hill. northwest 15 miles, Petersburg & Weldon R. R.
Pender, Burgaw, C. H., Wilmington & Weldon R. R.
Pender, South Washington, north 7 miles, Wilmington & Weldon R. R.
Pender, Rocky Point, south 8 miles, Wilmington & Weldon R. R.
Wayne, Mount Olive, south 14 miles, Wilmington & Weldon R. R.
Wayne, Fremont, north 15 miles, Wilmington & Weldon R. R.
Wayne, Dudley, south 9 miles, Wilmington & Weldon R. R.
Wayne, Pikeville, north 7 miles, Wilmington & Weldon R. R.
Wilson, Toisnot, northeast 8 miles, Wilmington & Weldon R. R.
Wilson Black Creek, northwest 7 miles, Wilmington & Weldon R. R.